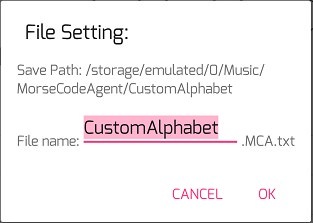 In MCA, you can change alphabet by clicking "Alphabet" button. After clicking "Custom" option, the alphabet is set to custom and the setting page is opened automatically. 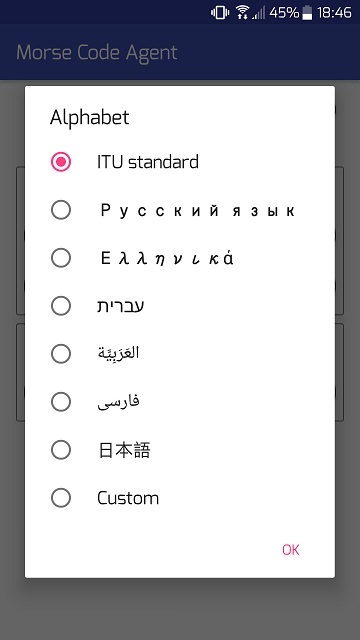 The default custom alphabet is ITU standard. "DEFAULT" button is set back the whole custom alphabet to default. Each code can be set separately. There is no check of reduplicate mapping. That is, ".-" and "-..." can be mapped to 'A' in the same time. But ".-" has higher priority than "-..." on encoding "A" to Morse Code. When "Distinguish letter case" is not clicked, the lowercase characters are converted to uppercase ones. Only uppercase characters are involved in encode and decode process. 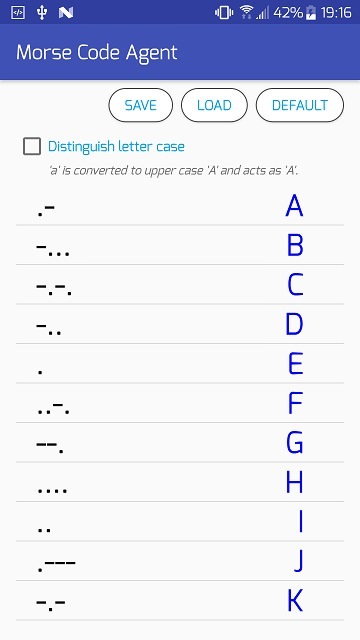 When "Distinguish letter case" is clicked, the uppercase and lowercase of the same letter are regarded as different characters. The custom alphabet can be saved to a pure text file by clicking "SAVE" button with fixed suffix: ".MCA.txt" . The save folder is Music/MorseCodeAgent/CustomAlphabet/. All Android devices have the Music folder, and all APP can write files into it if the "Photos/Media/Files" permission is granted. So we choose this common folder to save files. If the "Photos/Media/Files" permission is not granted. Save/Load is no guaranteed to work. You can browser files between folders. "../" means the upper folder. Only the files with suffix: ".MCA.txt" are showed in list. After selecting a file, click "Load" button to load the custom alphabet. Then loading page is closed automatically. Or you can share the file with "Share" button. This is the case of sharing the alphabet file as an attachment with gmail. The alphabet file is a pure text file. It can be edited by any text editor. The options of "aAareDiffient" is "true" and "false". Other code's option is a single character. If "aAareDiffient" is "false", then the character is converted to uppercase on loading. 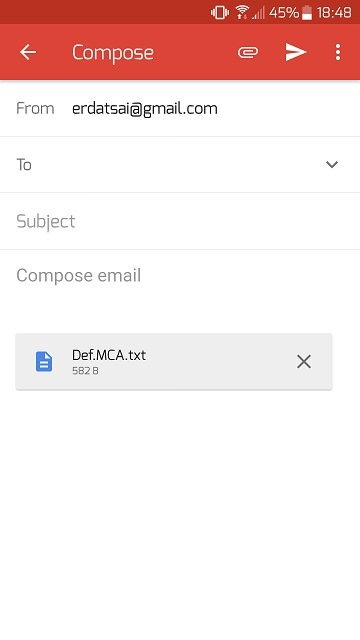 The attachment: aA.MCA.txt is an example to combine uppercase and lowercase in an alphabet.